Cement Restrictor – Metrimed Kft. 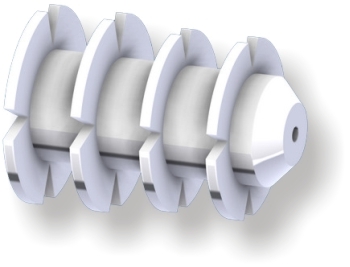 The PL type cement restrictor is used with cemented implants. It is designed to provide cement support of the femoral prosthesis stem by plugging the intramedullary canal. For X-ray follow-ups, each restrictor has a radiopaque marker wire. The Ø1 mm hole on the anterior part of the restrictor makes the cement restrictor permeable to gases, blood and irrigation during surgery.